Yummy Snack that goes very well with tomato ketchup and tea or cofee.Try and add your comments. Mix shredded bread slices(trim the edges first) with little salt,chilli powder, jeera powder,garam masala powder,2 tsp warm water and lemon juice well. Roll them into desired shape.Dip this into a beaten egg mixture. Then roll them over vermicelli crumbs.Keep it aside. Heat oil in a non-stick frying pan and shallow-fry the bread-vermicelli rolls on both sides till golden brown. Serve this hot with tomato-ketchup. 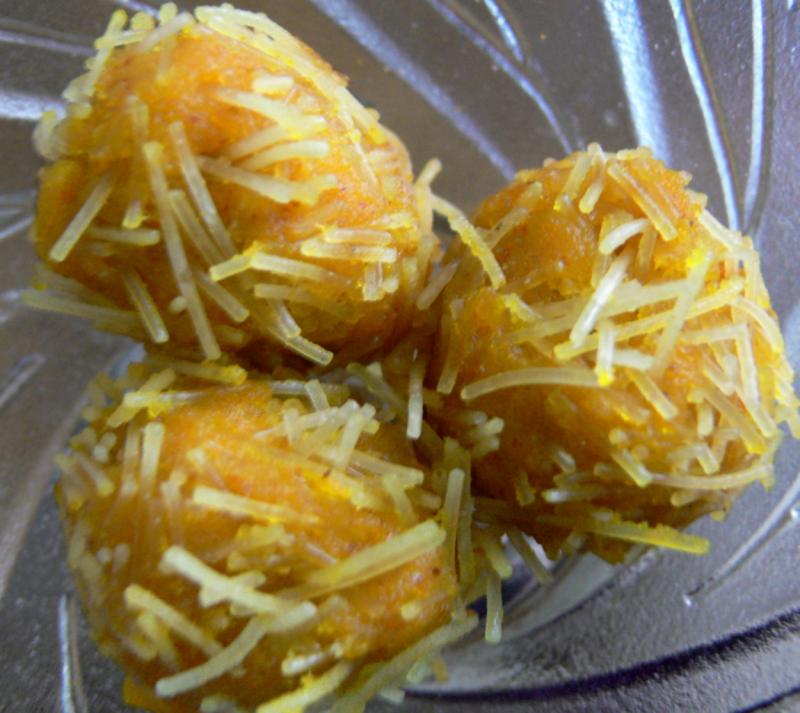 Hi Ritika!,for better result u can ghee-roast the vermicelli (adding 1 tsp ghee) for a min (shd not turn colour) and then keep them aside and use it for rolling the bread balls before deep-frying the rolls in oil. looks like a dessert.yummyy. But I have a doubt, Do v hav to fry the vermicilli before rolling, or v hav 2 use it raw. plzzzz advise.